Like other European countries, the Dutch economy has been struggling with great difficulties as a result of the outbreak of the financial crisis by the end of 2008. The crisis was in first instance mainly dominated by the threat of failing banks and capital inflows from the government. Other challenges, such as financial shortfalls, risk-averse behaviour by banks and a growing feeling of uncertainty among investors, firms and households, resulted in an economic crisis that followed (Bijlsma & Suyker, 2008). Third, a fiscal crisis can be distinguished from the financial and economic crisis, caused due growing national debts and decreasing tax revenues (Kickert, 2012, pp. 442-443). The impact of the crisis on economy and thereby related decline in employment, has proven to be significant in the Netherlands and other European countries (Bigos et al., 2013). Although decreasing levels of GDP growth have great influence on the resilience1 of labour markets, it is not the only factor that determines the performance of the labour market during a recession. Country-specific contextual factors, such as institutional structures, national and regional policies, social-cultural aspects and the industry structure, have a significant impact on the resilience of labour markets as well. Consequently, even countries who are comparable in terms of their welfare system, size and economy, like Belgium and the Netherlands, may differ in their responses to crisis as a result of their country-specific features. However, although these responses may differ, both countries could still achieve the same level of resilience (Fenger, Koster, Struyven & Van der Veen, 2014). 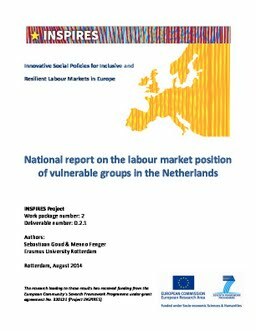 Against this background, this country report provides a qualitative assessment of the labour market position of vulnerable groups and country specific factors that contribute to labour market resilience in the Netherlands.